Campeche painted Doña María de los Dolores Gutiérrez del Mazo y Pérez in the island’s capital of San Juan about 1796 to commemorate Doña María’s marriage to Don Benito Pérez, a lieutenant in the Spanish royal navy. 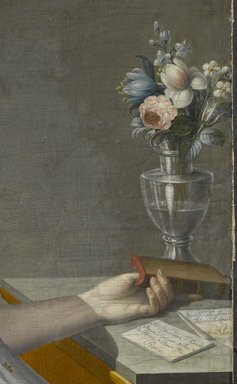 The painting, which has never been published or publicly exhibited, remained with the sitter’s descendants until 2012, when it was officially accessioned by the Museum’s Board of Trustees on October 18. The work was acquired with funds from the proceeds of the sale of Vasily Vereshchagin’s Crucifixion by the Romans (1887), which was sold last November at auction to benefit the Brooklyn Museum’s Acquisitions Fund. Doña María de los Dolores was born in 1775 in Alicante, Spain. At age fifteen she sailed from Cadiz to San Juan with her mother and stepfather, a newly appointed sergeant major in the Puerto Rican division of the Spanish navy. At age twenty-one, she sat for Campeche, the island’s first major painter, who portrayed her at home wearing a white muslin chemise dress–then the height of European fashion–and matching diamond earrings and necklace. In her left hand Doña María holds a copy of the popular Spanish play, Manuel Bellosartes’s La fuerza del amor conyugal, and with her right she gestures toward two folded letters that identify her and her husband, who at the time was stationed in the Puerto Rican port city of Ponce. Two years later, at age twenty-three, Doña María would die while giving birth to the couple’s only child, a daughter. Throughout the colonial era, Spaniards like Doña María and Don Benito crossed the Atlantic in search of fabled fortunes in the New World. 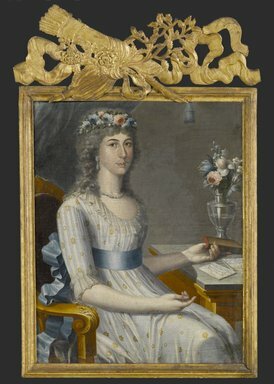 In the late eighteenth century, Puerto Rico’s elite turned to Campeche, the island’s official religious and portrait painter, to articulate their newfound wealth and status in images for display in private interiors and family chapels. Unlike his sitters, Campeche was of both African and European descent. His father was an enslaved African who purchased his freedom with earnings from work done as an artisan and his mother was a white Spaniard from the Canary Islands.